Monica Silva always loved animals. She became a large animal veterinarian in her native Brazil, where she and her husband Victor own and operate a 6000 acre working cattle ranch. The Silvas like pairs: they have two grown children, two dachshunds and two cats. They purchased eight acres in Davie, and opened Country Inn Pet Resort in 2006. Country Inn offers day care, boarding, training and grooming for dogs and cats. This state of the art facility has over twelve thousand square feet under air including an adjoining AAHA accredited animal hospital, with two onstaff vets. There are outdoor play grounds and pools to enjoy South Florida’s wonderful weather. 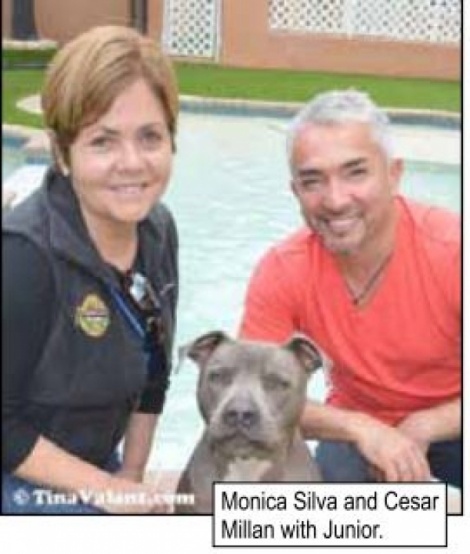 Monica Silva was crazy about Cesar Millan from the first time she watched him on TV. “Cesar’s philosophy always resonated with me. I love his attention to body language, and starting from the ground up”, Monica stated. His common sense approach, and devotion to dogs is admirable. She relished every episode of “The Dog Whisperer”, bought his books, DVDs and subscribed to his magazine. Monica secretly hoped someday they might meet, and maybe he’d even agree to film an episode at her Country Inn Pet Resort. “Dream big”, she thought. This year, Cesar Millan was on the grounds of Country Inn Pet Resort. He wasn’t there to visit, or even film an episode. Monica and Cesar have partnered and opened the first Dog Psychology Center outside of Los Angeles. Credit the law of attraction, divine intervention, manifesting or maybe that….in the words of Walt Disney, “All our dreams can come true, if we have the courage to pursue them”. Monica had a vision and Country Inn Pet Resort has expanded to 20,000 square feet under air with the addition of the Dog Psychology Center. Over fifty people, many accompanied by their dogs, enrolled for the first on-site, five day intensive workshop, also held in January. This wasn’t my first time seeing/interviewing Cesar---he is still as charming and genuine as he appears in the media. I even got a kiss from his handsome blue pit bull, Junior! “Cesar, how did you choose South Florida, for the first offsite Dog Psychology Center?” I asked. “Opening in South Florida made perfect sense, with a sunny climate, proximity to South America, and ability to serve dogs and their handlers on the east coast. Partnering with Monica and Country Inn creates synergy. We are able to serve all of a dog’s needs—not just the basics, but also instinctual, emotional, and spiritual through the DPC. Our primary goal is to provide information and education, while becoming a destination for dogs and the people who love and respect them”. “It’s imperative for a dog to be taken care of (all aspects) for who he is, as an individual. Dogs do not fail us. Human choices, our lack of information and education are to blame. We defend our own perceptions, even when they are not in our (or the dog’s) best interests. We don’t agree on dog-related issues - as a country, a community and sometimes even within a family. By adapting to a philosophy of helping dogs by educating ourselves, we can learn to honor a dog’s true identity, while respecting the animal we spend our lives with. I believe harmony and balance can be achieved between dogs and humans— to the point where euthanization, breed specific legislation (BSL), and overpopulation may become past history. Let’s all dream big, for these things!